Gambia’s President-elect Adama Barrow has lost his son who died on Sunday after he was bitten by a dog. 8-year-old Habibou Barrow is reported to have died on the way to the hospital after a dog bitten him in Manjai near Banjul. Gambian journalist Fatu Camara confirmed the incident on Twitter saying “he was rushed to the hospital but couldn’t make it”. The president-elects’s media team confirmed the news to local Gambian news portal Freedom Newspaper on Monday. “Yes, Habibou Barrow passed away last night after being bitten by a dog. He was the 8 years old son of the second wife of Adama Barrow. He will be laid to rest today at 2 pm,” they quoted an unnamed member of Barrow’s team. 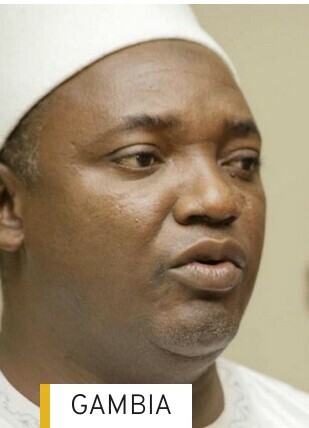 Adama Barrow is currently living in Dakar since Sunday at the request of the ECOWAS chairperson Ellen Johnson Sirleaf. Senegalese President Macky Sall agreed on Saturday to host Barrow until his inauguration on Thursday when he will be escorted by some African leaders to the event. It is not clear if Adama Barrow will return for the funeral ahead of his inauguration which is being contested in court by outgoing President Yahya Jammeh who has petitioned the Supreme Court to annul and rerun the December 1 polls.